Well I've managed to finish in one piece, so I'm quite relieved! 2.53 was the final time. I held 4min kms comfortably for the first half (halfway in 1.25ish), but tiredness (or more precisely lack of fitness) came on quite quickly around 25km, so it was grovelling time from there to the finish. 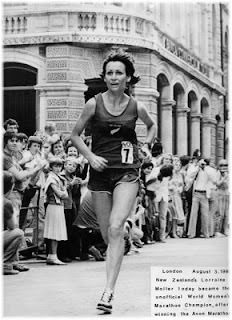 Photo: Lorraine Moller winning the first London Marathon: An all women event, organised by Wellington, New Zealand, resident, Kathryn Switzter. The intention of this event was to demonstrate to the IOC that the women's marathon was an event worthy of inclusion in the Olympics. Female runners were finally allowed to run the Olympic marathon at Los Angeles 1984 where Lorraine finished 5th. The London Marathon has gone on to become a truly international spectacle. problems and can look forward to some training this winter. London marathon is an incredible event. I would put equal with New York. Every marathoner must do one of these events in their marathon career. Masses of people, both running and supporting. Superb organisation. I can't thank you enough! You got me to the start line (when 4 weeks ago I had given up all hope) and I was able to run all the way. Thank you, thankyou, thank you! I will be back to see you when I return. I suspect my quads will need a lot of work over the coming months. Despite not being able to run with jsut four weeks to go, I never doubted that Todd would make the start line: It was only a matter of how fast he would be able to run and the condition he would be in at the finish. Formthotics Shock Stop inner soles. Replacement of various nutrients that he appeared to be low in and that might be slowing healing and reducing exercise capacity. Massage of the calf muscle and all the running muscles. To my advantage is a lifetime of intense sport and a dozen sub-3hr marathons myself; so I knew what was involved which sure does help with zeroing in on the problems and sorting them out without wasted time, effort and money. Far too much medicine, including most orthotics is hit and miss stuff.